The Coalition announced a plan to boost the instant asset write-off from $25,000 to $30,000 for small to medium businesses in the proposed new 19-20 Federal Budget. An instant asset write-off allows businesses to claim any suitable purchase under the amount as a deduction through their tax return. Previously, small to medium sized business with an annual turnover of less than $10 million were eligible, however the recent changes have allowed businesses with an annual turnover of up to $50 million to participate. 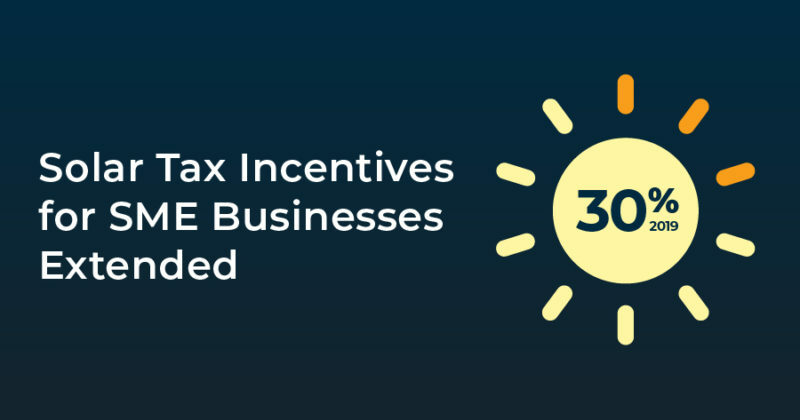 The increase will allow 3.4 million Australian businesses to be eligible. The new rules are set to remain in place until June 30, 2020. Both multiple new and used assets costing no more than $30,000 qualify, so long as they are invoiced separately. Commercial solar PV systems are an ideal asset for the $30,000 tax incentive. While your system will depreciate over time, the savings it generates for your business will only increase as energy prices rise. Plus, you’re still able to claim government incentives or STCs, meaning that your out-of-pocket cost could be considerably less than the write-off figure. To ensure your purchase falls below the $30,000 maximum, your system will probably be around 20kW in size. Infinite Energy can advise you on what size system is suitable for your business, and provide you with a no obligation proposal. Solar is a significant financial investment, and at Infinite Energy we treat it as one. To ensure your business makes the right financial decision, our customised proposals address capital outlay, investment yields, payback periods, NPV and more. Due to rising electricity prices, business owners face considerable uncertainty surrounding their power costs. Installing a solar PV system allows your business to produce a portion of its own electricity requirements on site, thus removing some of this uncertainty. This allows you to make business decisions more confidently, knowing one of your largest expenses is under control. Installing a commercial solar PV system will help your business significantly reduce its carbon emissions. Plus, because your solar electricity is generated on-site with no transmission losses, it offsets even more than it generates. Being seen as a green company is a great PR and marketing tool, making your business more attractive to both staff and customers.